What is a variety? It is the set of common zeroes for a set of polynomials. For example, for the set of polynomials , the variety is . Now what is a projective variety? Simply put, it is the common set of zeroes of polynomials in which a one-dimensional subspace is effectively considered one point. Hence, for the variety to be well-defined, if one point of a one-dimensional subspace satisies the variety, every point of the one-dimensional subspace has to satisfy that variety. Confused? Take the polynomial . The point satisfies this polynomial. Now note that the points also satisfy this polynomial for every . Hence this is a projective variety. Now take . Here satisfies the polynomial for only . Hence, this is not a projective variety. But why? Why would you want to consider a whole line as one point? When you watch the world from your little nest, every line running along your ine of sight becomes a point. Hence, athough it may be a line in “reality” (whatever this means), for you it is a point. This is the origin of projective geometry, although things have gotten sightly complicated since then. Index categories: These are categories in which the objects are essentially elements of a partially ordered set, and there exists at most one morphism between two objects. One example would be , where Hom iff . Let be an index category. A functor is said to be indexed by . What does such a functor look like? If this functor is fully faithful, then will also be an index category. However, even if it is neither faithful nor full, there is some structure that is imposed. For example, if is , then we can index a subset of objects in , and ensure that morphisms exist between all such indexed objects (mapping objects of lower indices to those with higher indices). Limit: Let be indexed by . Then the limit is an object such that there exists a morphism between and every object (including itself), and if and are two such objects with Hom (remember that is the functor between and ), then the three morphisms under consideration commute. So what exactly is happening here? It is easy to see that is the initial object in . For example, let Set be a functor which maps , and the morhism is mapped to the morphism . Then or is the unique limit. Similarly, the colimit is the final object of , where is any partially ordered set. Filtered set: A nonempty partially ordered set is said to be filtered is for any , there exists a such that and . For example, is fitered, and so is any subset of it. However, if , and is the only relation we know, then this is not a filtered poset (partially ordered set). Philosophy behind adjoint functors: These ensure that at least the set of morhisms between objects (both in the domain and range) are “isomorphic” to each other, whilst not being concerned about the objects themselves. This is intended to be a series of articles, that fleshes out the bare skeleton of Algebraic Geometry. I will be closely following Ravi Vakil’s treatment of the topic, supplemented with other treatments. A category consists of a “collection” of objects, and for each pair of objects, a set of morphisms (or arrows) between them. Note that the objects being considered need not be distinct. In the category of sets, for instance, the identity morphism is also a legal morphism. The set of morphisms between objects and is referred to as Mor . 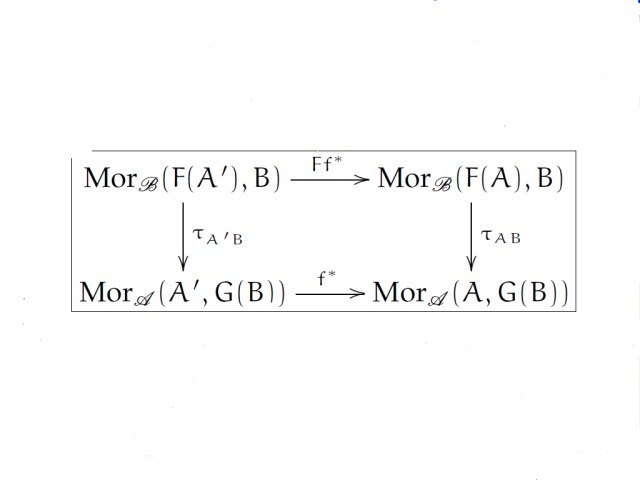 Morphisms compose as expected: if Mor and Mor , then Mor . Composition is associative: . Also, for each object Obj , there exists an identity morphism id . If Mor , then id . Also, if Mor , then id . Fibered products: These can be best studied with a diagram. Suppose we have and , then the fibered product is an object such that it is universal for any object mapping to both and . For example, let us consider the category comprising of all ideals of , and a morphism exists if . Then, if and , we can see both lie inside . Hence, we can choose . Now every object that maps to both and needs to be generated by a multiple of . Hence, will be generated by , or . Functors: A covariant functor is like a homomorphism between categories and . A contravariant functor is slightly different. It maps Mor to Mor . For example, the identity functor is covariant, while the functor mapping topological open sets ( implies ) to differentiable functions on them is a contravariant functor. I would like to discuss the contravariant functor mentioned above. Let us consider the category of open sets in , such that morphisms exist between two objects only when the domain is a subset (not necessarily proper) of the range. For example, there exists a morphism between and . 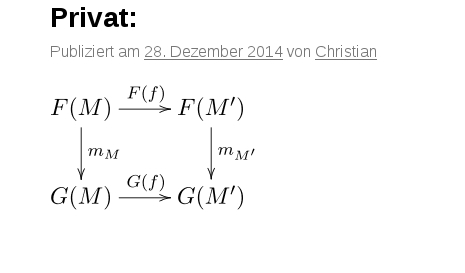 Now consider a differentiable function on , like . Clearly, it is also differentiable on every subset of , including . Hence, there is a mapping from the set of differentiable functions on to those on (functions map to themselves). However, this mapping may not be surjective. For example, is differentiable on but not on .